To be honest, there aren't a lot of scenic angles at Walt Disney Studios in France. It remains the least photogenic Disney park of any that I've visited. However, there are exceptions, and the "hub" of the Production Courtyard is one of them. 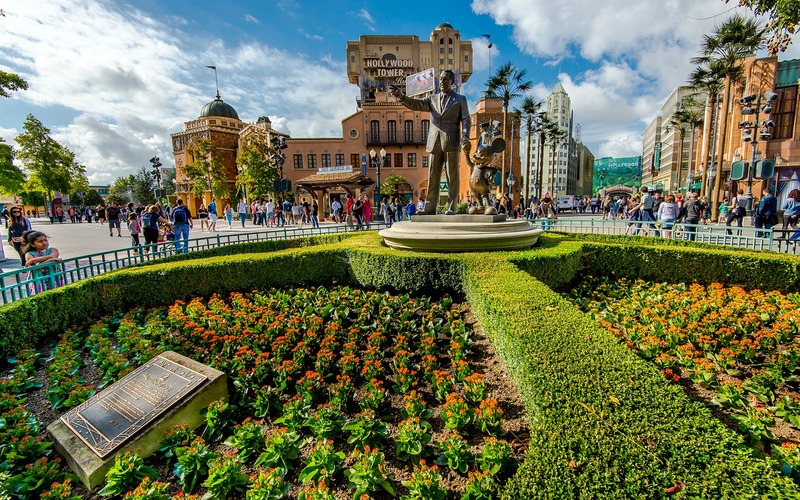 The beautiful flower bed surrounding France's Partners Statue provides a nice, green softness to an otherwise open and often lifeless-feeling outdoor space, and the facades beyond are enough to give a visual interest and depth to a photographic composition. It also helped that the sun cleared up the skies a bit whenever I seemed to stop by this part of the park! Walt and Mickey stand in front of the Production Courtyard at Walt Disney Studios.